Did you ever dreamed to offer your customers Portable Track? We think yes. 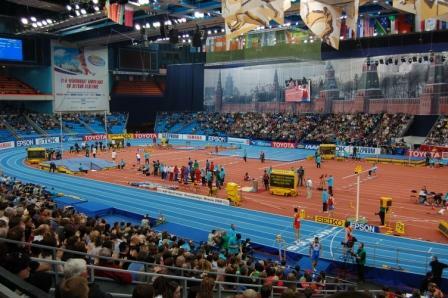 Any manufacturer of athletic track systems likes to have World and European Championships on his reference list. ﻿However you had stopped on the midway. Perhaps the portable track itself, where you’d like install your surface became a main obstacle. Well, such structure isn’t on sale in supermarket next to you. After analyzing all difficulties that you may face and necessary investments, you probably lost your interest. Absolutely in vain﻿. All has already changed. We with pleasure will help you and we will incur the most difficult part of the project – manufacturing of yours Portable Track. In year 2006 for the first time in history the track and field World Championships, the synthetic surface and arena haven't arrived from Apennines peninsula as before. We had success alone, we can repeat it together with you. Having passed a hard way in search of optimum technical decisions, in working out of engineering specifications and manufacturing Portable Track, we have performed the most difficult part of work. 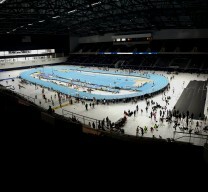 Now we invite you to share our success and to lay your surface on the new arena built for you. Why we offer it to you? Very simply: we do not manufacture synthetic surface materials and are not related with no one of the brand presented in the market. Our concept of the independent installation company allows offering the services to any manufacturer, and our long-term experience – is guarantee of qualitatively performed work. But, now we offer you more. We offer partnership on a new, interesting direction on which you can be successful too. How do we see our partnership? We see it as cooperation on the basis of mutual respect and partner relations. You can order manufacturing of standard IAAF arena as well as any another, corresponding to your, specific requirements. Any your wishes will lay down in engineering specifications basis on which we will build Portable Track for you. For the convenience, the design can be made taking into account transportation and the subsequent storage in 20 ft containers. Or in any kind convenient for you. You can choose when and where your synthetic surface will be laid on Portable Track. We are ready to offer you surprisingly economic scenario. Ask us. What kind of design we offer? The hot galvanized supporting frames are made from a rectangular steel profile by thickness of mm of 3 mm with adjustable “legs” that allows to level arena ideally even on not an equal floor. Flooring frames, as made from the steel, zinced profile. The surface, on which your track system will be laid, is executed from strong plywood. Take of boards and pole vault boxes are integrated into panels for easy and proper set up. Landing pits for long and triple jump made with sand traps and hard shield covers. You may also think that approximately 3 700 m2 of synthetic surface is not reasonable quantity to sale. We didn’t hear that any of PortableTrack was sold less than 1 000 000 EUR. Did you? European Indoor Championship Arena (March 2013, Goteborg) under construction at our Workshop. Ask for more information here.